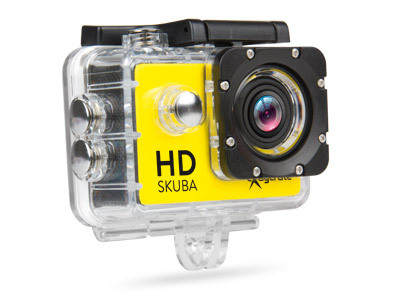 Exagerate Skuba Action Cam is a compact and lightweight action camera with a built-in 2-inch LCD display ideal for capturing your adventures. The HD video resolution and 110° wide angle lens allows impressive shooting. The supplied waterproof case allows underwater use up to 30 meters and provides protection against shock and dust in every other situation of use. The floating hand grip offers a solid and stable grip while shooting movies as well as allowing the camera to float on water. The rechargeable lithium battery provides up to 90 minutes of video recording.